The Challenger Division was established in 1989 as a separate division of Little League to enable boys and girls with physical and mental challenges, ages 5-18, or up to age 22 if still enrolled in high school, to enjoy the game of baseball along with the millions of other children who participate in this sport worldwide. Today more than 30,000 children participate in more than 900 Challenger Divisions worldwide. Teams are set up according to abilities, rather than age, and can include as many as 15-20 players. Challenger games can be played as t-ball games, coach pitch, player pitch, or a combination of the three. In a Challenger game, each player gets a chance at bat. The side is retired when the offense has batted through the roster, or when a pre-determined number of runs have been scored, or when three outs are recorded. Little League recommends that no score be kept during Challenger games. The Challenger players wear the same uniforms and safety equipment as other Little League players. One of the benefits of having a Challenger Division is that it encourages the use of "buddies" for the Challenger players. The buddies assist the Challenger players on the field but whenever possible, encourage the players to bat and make plays themselves. However, the buddy is always nearby to help when needed. 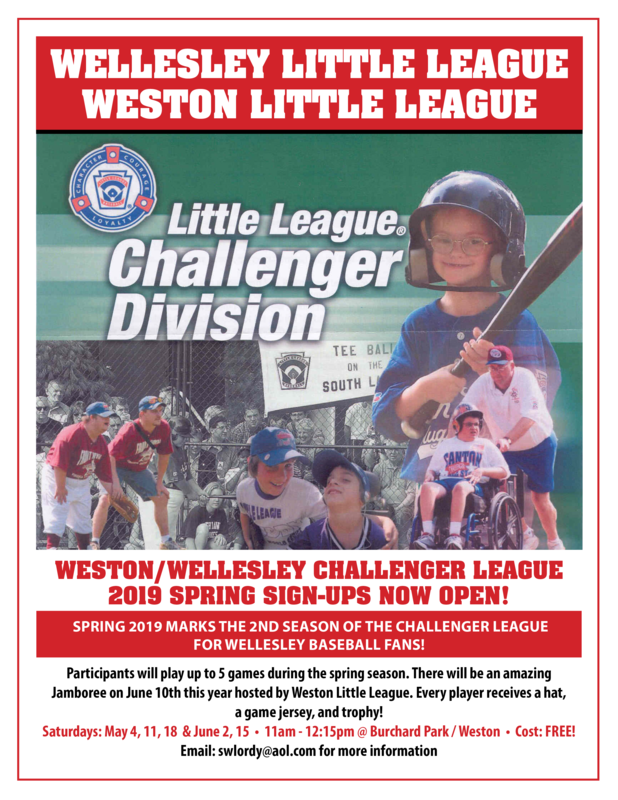 REGISTRATION IS DONE THROUGH WESTON LITTLE LEAGUE. CLICK IMAGE BELOW.